“Every bottle of wine is a live performance,” they say. Well, for many centuries now, Lanzarote has been giving a world-class theatrical production. The world is its stage, and every sip and glass is a character with a story to tell. Journey through the Wine Route and have a taste of the island’s culture, history, and ingenuity. 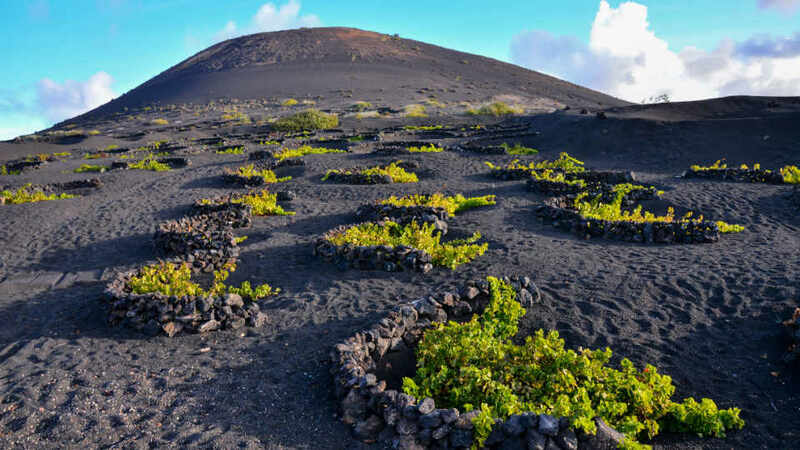 Whoever said wine is only for the palate has not seen the volcanic vineyards of the easternmost island of the Canaries. In the numbers game of the Canary wines, Tenerife is leading by a mile and has been winning since it began. Bottles bearing the name of the behemoth dominate shelves after shelves. When it comes to attention and interest, though, heads turn east of the archipelago. Where the eyes go, the feet sooner or later follow and down the Wine Route of Lanzarote they tread. Fascinating and one-of-a-kind, the island’s vineyards captivate even non-wine lovers. They weren’t made that way only to enchant and please the eyes though. Of purpose and beauty, they are an age-old proof of the cleverness and hard-work of the local farmers. 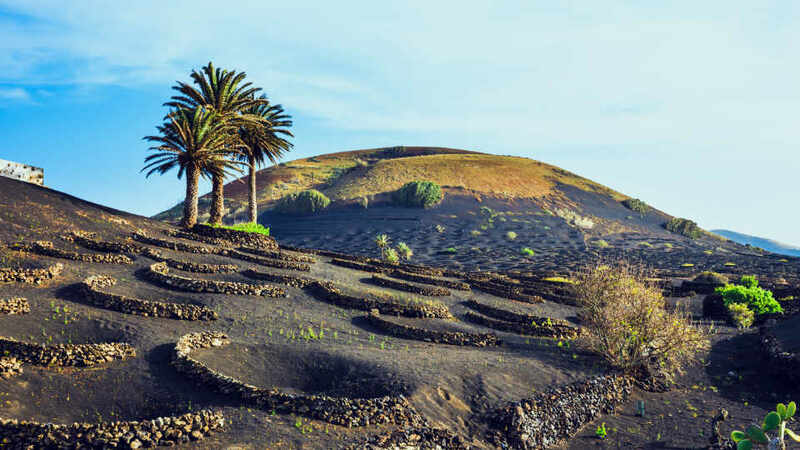 Long before tourism swept the Canaries, agriculture ruled the islands. That reign, however, was cut short in the 1730s by a volcanic eruption that veiled a third of Lanzarote with ash. Unexpectedly, it was from that nothingness the locals’ genius sprung. The lack of rainfall and harsh African heat made farming a challenge. With the addition of volcanic soil that can’t seem to grow any plant, it became almost impossible. The farmers’ persistence and tough grind prevailed though. Holes were dug into the black soil where vines eventually grew. Protected by low crescent-shaped stone walls, strong winds failed to decimate them. Once a natural disaster, it also gave birth to the Wine Route. It’s a network of wineries and vineyards with centuries-old vines that live to this very day. Every drop of wine from these wineries contains the island’s culture and history. Its flavor and bouquet can only come from the volcanic minerals that is now very much part of the land. 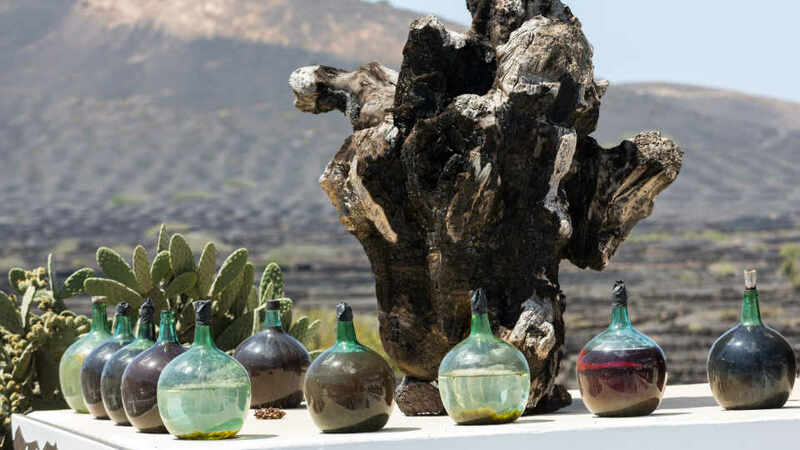 Every bottle has a long story to tell and is distinctly Lanzarote down to the last drop. 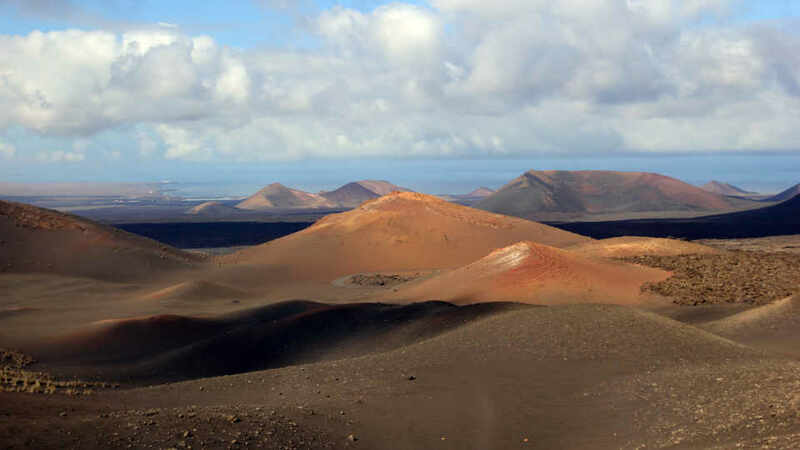 Most are in La Geria, a protected zone sprawled in the municipalities of San Bartolome, Tias, Tinajo, Teguise, and Yaiza. A few others are in the villages of Uga and Masdache. As these wineries are close to each other, visiting several is easy and recommended. A low semicircular stone fence safeguards a vine that grows at the center of a hole dug out of the volcanic soil. If one is already enough to pique anyone’s curiosity, imagine what fields and fields of it can do. Well, they made plenty of vacationers book a flight and add Rutas del Vino to their itinerary. Aside from the panorama of unique vineyards, each winery also has its signature range of wines. It is for that reason vacationers, especially wine enthusiasts, must swing by a couple. Some even have a museum of Lanzarote’s wine production and its history. 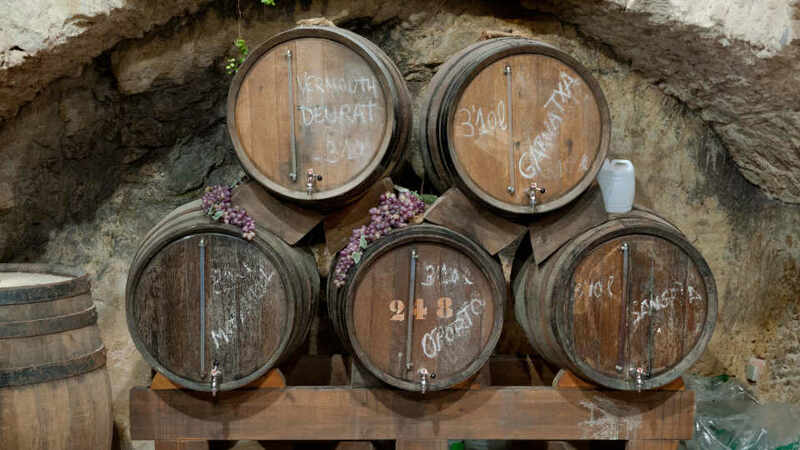 Bodegas La Geria is an original 19th-century building of traditional Canarian architecture. As it is whitewashed, it stands out from the dark volcanic expanse that encompasses it. And, because it stands on higher ground, it has an impressive view of the vineyard. It is also the most visitor-ready of all the bodegas in the Wine Route. Housed in its old singular structure is a spacious shop of their selection of wines. They also have a tasting room so guests can sample a liquor before making a purchase. For visitors who want to enjoy their drink with a meal, they can do so in the small restaurant adjoined to it. Tourists can visit any day from 9:30 pm to 7:00 pm. The fee starts at €8 per person. For guided tours, visitors can book a schedule with a 1:00 pm start time during weekdays. Just call (+34) 928 173 178 or shoot an email to bodega@lageria.com. Bodegas Rubicon stands on the other side of the LZ-30 road and is neighbors with Bodegas La Geria. Guests love that it is an open house. That means free entry to the barrel cellar, the exhibition area, the old family home, and the tasting rooms. If that doesn’t suffice, how about pairing the famous Rubicon wines with tasty tapas? Go ahead, because there’s also a restaurant in the property. Tourists can drop by daily from 10:00 am to 11:00 pm. On Wednesdays, though, it closes earlier at 8:00 pm. Big groups are also very much welcome. Please get in touch with the Bodegas Rubicon in advance so that a guided visit can be booked. If a winery is the largest and the oldest in the island and is one of Spain’s most ancient, it is without a doubt a must-visit. Bodegas El Grifo in La Geria, built way back 1775, is all that and more. Its vast 60-hectare vineyard makes the others look tiny in comparison. Also in the massive complex is a barrel warehouse that can store up to a little more than a million liters of wine. And, of course, they also have space set up for wine tasting. In case guests aren’t impressed yet, there’s an ethnographic museum in the property too. Here, an assembly of tools and machinery used in the many centuries of wine production are on display. It is open daily from 10:30 am to 6:30 pm. Guided tours can also be arranged, so don’t hesitate to contact them in advance. Please note that the tour schedules are at 11.00 am, 1:00 pm, 4:00 pm, and 5:00 pm daily. They include a visit to the museum, the vineyard, and tasting of award-winning wines. Bodegas Los Bermejos is still in infancy compared to the other wineries in Lanzarote. Opened in 2001, it may be young, but it is already the second largest in the island. Also, wines produced by this young giant are anything but amateur. The bodega is open on weekdays from 7:30 am to 3:30 pm. Visits must be booked in advance though because they do not allow walk-ins. To do that, please contact La Florida Winery, which is situated northeast of the old Bodegas El Grifo. Timanfaya National Park, Charco de Los Clicos, Los Hervideros, Salinas de Janubio, and César Manrique’s Monumento al Campesino are nearby. 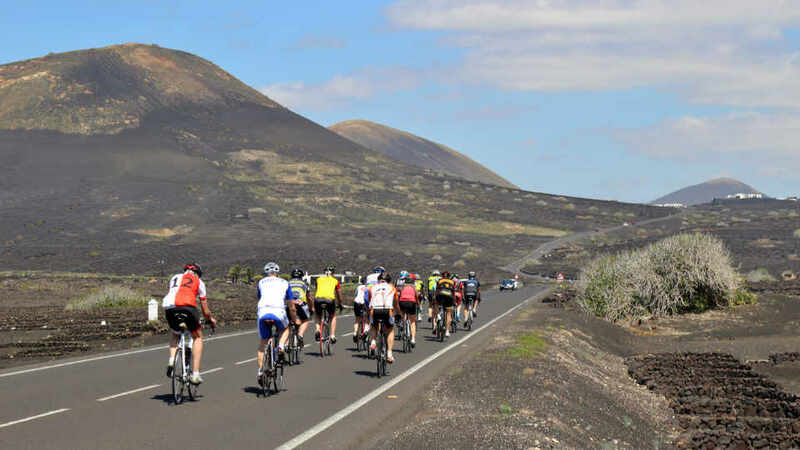 Visit other tourist attractions and make the most out of the Lanzarote vacation. Hikers and those with extra time in their hands can take the whole Wine Route by foot. Another exciting trail is the one from La Asomada to La Geria. In summer, the bright green vines are most visible. Thus, vistas of the vineyards are incredibly breathtaking during this time. Vacationers can also go on camelback to make the visit truly unforgettable. The Fiestas Nuestra Señora de la Caridad held every mid-August in Bodegas La Geria is open to the public. This annual celebration showcases the island’s traditional harvesting process and wine-making. Tourists not only get to the know the locals and their culture, but they also get to partake in the event too. The participants pick and load grapes into a wooden container carried by camels. A ceremonial procession then leads them back to the winery where the crops are pulped by foot. La Geria is home to many wineries, but it lacks dining options. Excluding the ones in the bodegas, El Chupadero is the only restaurant in this quiet stretch. Diners can rest assured it doesn’t disappoint though. As expected, it offers an extensive selection of wines and delectable tapas. Diners must also try their gazpacho, calamari with capers, bacon-wrapped dates, albondigas with peppers, and crepes. Take some time to appreciate the marvelous views as well. 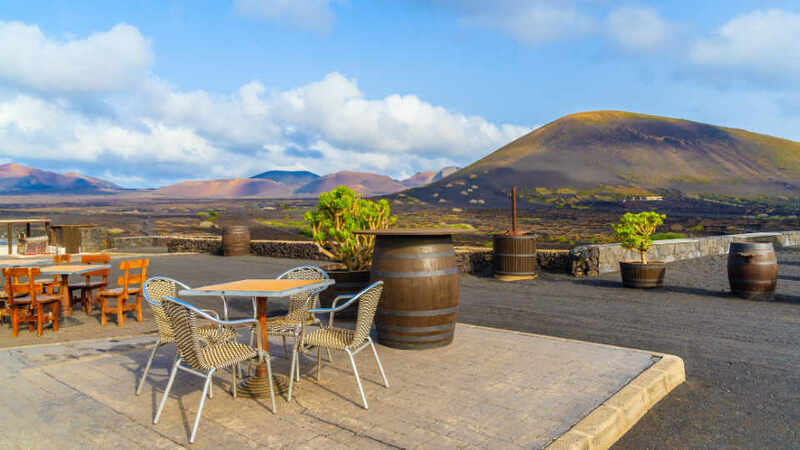 Soaking in the volcanic panorama while sipping divine-tasting wine, indeed, sounds fantastic. Many tourists use the public bus system to go around Lanzarote as they are reliable and cheap. In getting to the different bodegas of the Wine Route, however, most prefer to hike, rent a car, or join excursions. Aside from the multiple winery stops, no bus crosses the LZ-30 where many of the bodegas are. One way to visit is to go by bus to the nearby villages that are excellent starting points for hikes and walks. Vacationers can also look for car rentals there. From Arrecife, bus line 60 takes tourists to Uga and Yaiza. Those who prefer to drive or walk from Yaiza must take LZ-2 road to Uga, and cross the village to get to LZ-30. Those starting from Uga only need to follow Calle Agachadilla which leads to LZ-30. Another favorite starting point is Masdache where a few bodegas are situated. From the capital Arrecife, vacationers can take bus line 32 to Masdache. Once there, they can visit the three wineries in the area first. Then, they may go southwest via LZ-30 for more. Not a lot of tourist attractions were created from desolation. And, even fewer can claim that they were made through hundreds and hundreds of years of hard work. The age-old vineyards of the Wine Route are both, but with a little more character. It was an expanse covered with volcanic ash. Its rugged terrain surrounded by volcanoes looks more like the Martian landscape. Then, it was turned into a vast stretch of beautifully peculiar grape plantations. From the barrenness came something magnificent that people still marvel at even today. Out of worthless ruins sprung vines that produce top-notch wines. Who would have thought? The locals didn’t; they just knew they had to try and keep trying. For holiday-makers who want fun vacations with substance, the Wine Route awaits. Admire the unique panoramas, drink internationally renowned wines, and taste the island’s heritage. It’s a day trip to the past that ensures the future while in the present. So, why ever not?